Players now earn credits and experience every time they go into a tournament! Compete to win gold while earning credits and experience each time you face an enemy team! Please note: there are still 2 ways to register for the Skirmishes! Register Weekend: Teams ONLY play the three playoff days (Fri - Sun). Please be sure that you register your team correctly!! 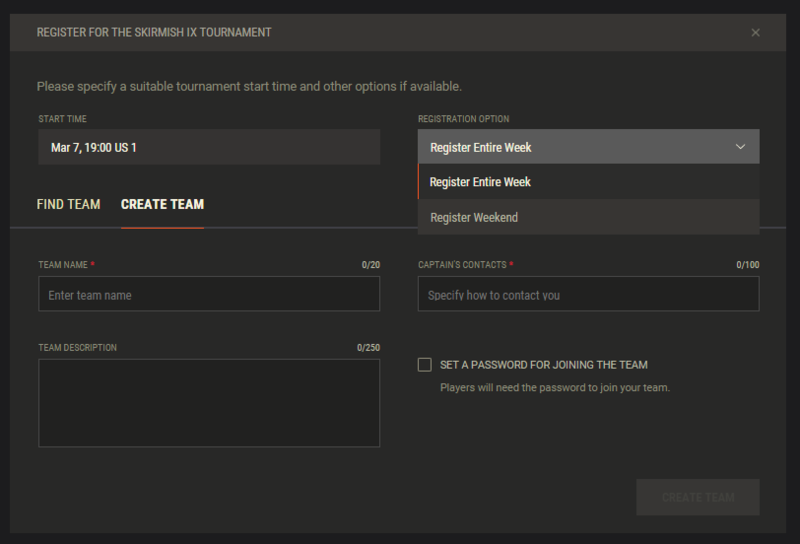 Captains, when you create a team, you will see a "Registration Option" on the right hand side. The default is set to "Register Entire Week." If you use the drop down, you can select the "Register Weekend" option. If there are any questions or concerns, please let us know! Does this mean faster payouts with the new system? Is there still a way to search by team name? I can't find it anymore. FYI guys, Registration has been re-opened for teams to sign up for the Weekend Playoffs ONLY. Any teams that register for the Entire Tournament WILL NOT PARTICIPATE. My team (322nd) had signed up for the entire week but we don't seem to have any battles today. Did we get lost in the process or something? Where can I see my group? like before where there was a link with all the groups, and each one had a individual link. Edited by spedkey, Mar 08 2016 - 04:08. Did the Gold Rewards change? I seem to remember it was based on where you place during the group stage, for example I think the top 10% of teams got 1,000 gold per day. Meaning that at the end of the third day of group stage if the final percentage of all three days for that team is within the top 10% they would get 3,000 gold. Now is it a flat 1,000 for all three days, instead of per day? When did you confirm you team? All teams that were confirmed when registration closed this morning were accepted for the entire tournament. Unfortunately, with the new system, we need to re-open registration for both the entire week and weekend playoffs, if we want weekend playoff registration to close on Thursday/Friday. So, any week-long teams that confirm after the tournament has been scheduled will show as confirmed, but have no battles. It's still per day. I'm trying to figure out how best to show the prizing, with the way the tournament page is set up. We don't have as much flexibility as we have in the past for some things. Btw we're getting spamed by notifications again like what happened during testing. It's been reported, thanks Sadly, it's not something I can fix, so I can only pass it on up the chain. It did. There were several times we would forget to submit the team but would be accepted anyway. We registered for weekend only, but assumed that, as always, we could confirm registration on Thursday. Our team shows "unconfirmed" but I don't see where to submit the team. Reading previous posts and your replies, do we have to reform? If so, can we still use our name or do we need to use a new name? Do I understand that in the future, Skirmish X and onward, the weekend only can submit on Thursdays again? Or do we need to motivate our people to sign up a week in advance and submit by Sunday for the following weekend. Forgive me if my questions are covering things asked and answered, but I'm kinda scrambling right now, and confused. And old.. Thanks for all the work you do to put these together for us!!! It seems as though this new system doesn't allow registration to continue after the tournament has started, even if it says registration doesn't end until Thursday. This is something that we didn't realize would happen, so we will have to adjust things going forward. For Skirmish X, registration will close Monday morning for both weeklong and weekend registrations, out of necessity. However, for both Skirmish IX and Skirmish X, any weekend teams can send an email to tournaments@wargamingamerica.com to request roster additions/deletions or to ask us to submit the team. Teams can send any requests for Skirmish IX until 8 am PT on Friday. If the new system doesn't work properly in the notifications department, they should disable that section, and THEN see what's wrong and work from there. Edited by spedkey, Mar 10 2016 - 03:41. Competitive Play → Tournaments → Tournament Archives → Skirmishes → Skirmish IX ?